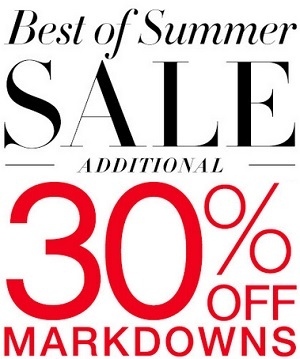 Shop the Best of Summer sale at BCBGMAXAZRIA stores in the United States. Take an extra 30% off all markdowns. Offer is also available online on the official website. Source of the information is BCBGMAXAZRIA. Offer ends 09/07/2015. More information available at BCBGMAXAZRIA stores or online.